I was a bit nervous of this exercise as it was a much larger study. I chose this particular scene along the river in Dedham as it is a beautiful place with many memories of childhood walks with my family. Some happier than others. Also it is ‘Constable country’. This drawing reflects my feelings about the place, in some ways the scenery is soothing in its beauty but the copiced trees with their pale trunks and spikey branches, leave me feeling uncomfortable and edgy. 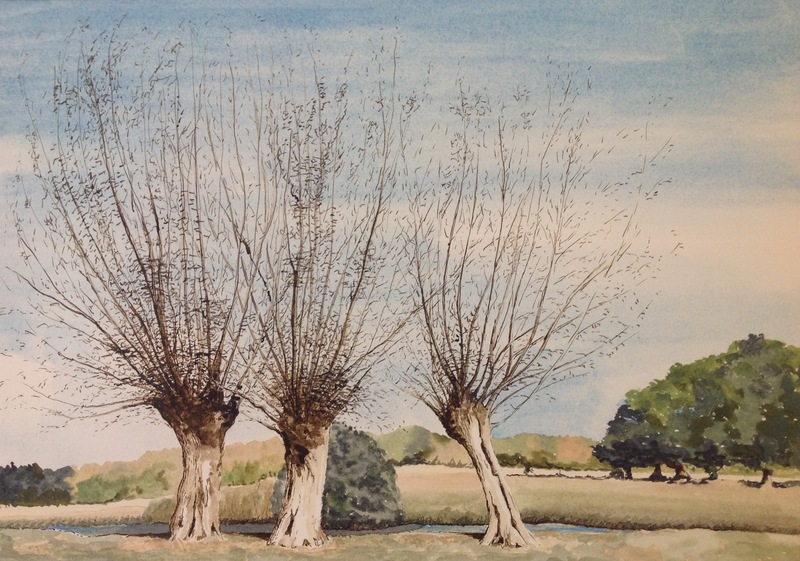 I have used pen and ink again with watercolours for the background to give a contrast between the trees in the foreground and the trees in the background. I have tried to use paler colours and less detail in the background to give a sense of distance. As the light hits the copiced trees from the front/ right I have left areas without colour to show a more dramatic contrast in tone. I have tried to work with broad tonal areas for the fields and avoid detail to give some sense of distance.